The aquaponics project was started this fall as part of a “Science and Society” class introduced by Charles Ireland, Sayre’s new principal. 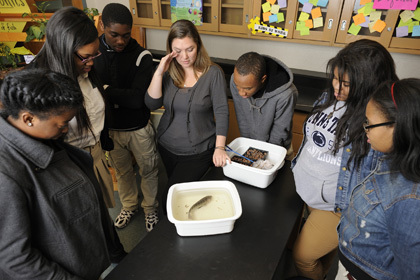 The goal is to use aquaponics systems to help students connect their classroom experience with future educational and career opportunities. In an aquaponics system, fish are raised in tandem with plants; their waste contributes nutrients necessary for the plants to thrive. So far, the students have built two aquaponics systems for their classroom. Using two 55-gallon fish tanks, they’re raising 19 tilapia. The tanks are connected to grow beds that hold bell pepper plants, chives, jalapenos and lettuce. When asked why the lettuce is yellow, the students explain that the soil is missing nutrients, mainly phosphorous. The systems have been helpful teaching tools for Curry. Classes, like those on the nitrogen cycle, are now a hands-on lesson. On Fridays, Curry takes her students to the Urban Food Lab at the Partnership Community Development Corporation (CDC) on 60th and Walnut, only a couple blocks away. There the students compare their classroom system with the CDC’s much larger one, tending seeds, measuring plant growth and taking water samples. Curry is also planning a visit to Cheyney University, which has one of the largest aquaponics systems for basil. Eventually, she’d like to build a bigger system outside in a greenhouse to be used for year-round education. Despite some earlier apprehensions, the students agree, Fridays are “100 percent better” since they started the project. And Curry confirms this. “[Student] attendance is actually better than it is on other days of the week,” she says. For now, there isn’t much produce, but any that's grown will be sold at farmers markets and donated to food cupboards along with the harvest from Sayre's garden. The garden is part of University of Pennsylvania’s Urban Nutrition Initiative. However, as part of the class, students are creating business plans for their products. Some want to sell to restaurants, others want to donate to the community or start their own CSA. The intention for the program is to give students the experience and encouragement to pursue education and careers in sustainability.